Spring is in the air. The lilies in my yard are popping up, and there are buds on our trees! The longest Michigan winter I can recall is coming to an end! 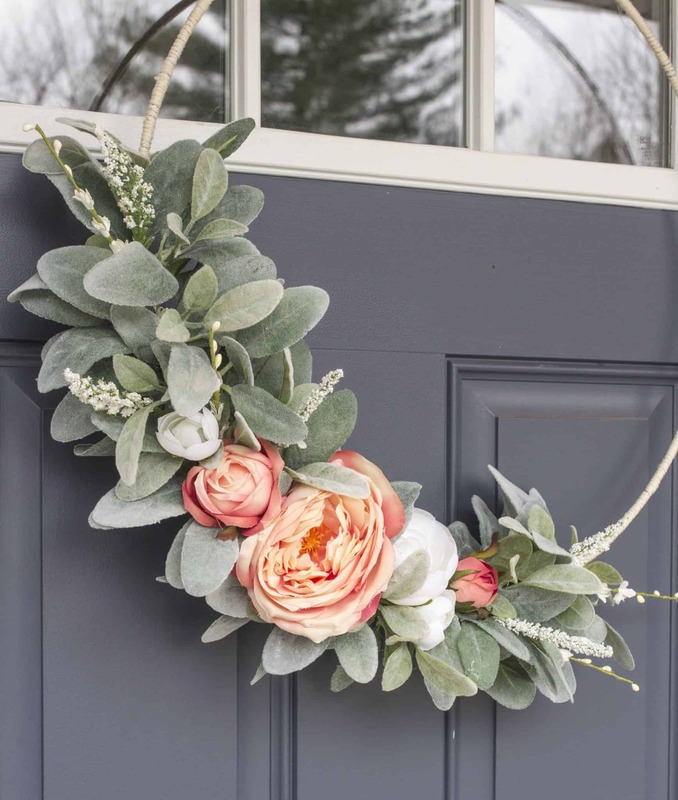 Spring home decor has been catching my eye lately, particularly pink and green spring wreaths! Many years ago (12?!?) I took a class on making wedding flowers, so I decided to see how well that translated into wreath making! It really wasn’t difficult, just took some time and patience! 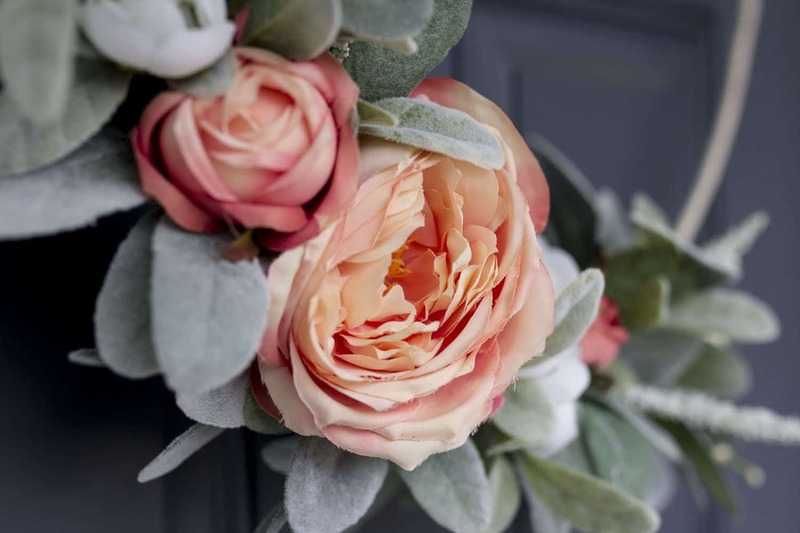 The soft, romantic pinks of the peonies and the minty green of the lambs ear is just so beautiful together! My front door is deep blue, which would look great with those colors! I was also struck by the minimalist hoop design too. That is a fresh, new idea which I love. 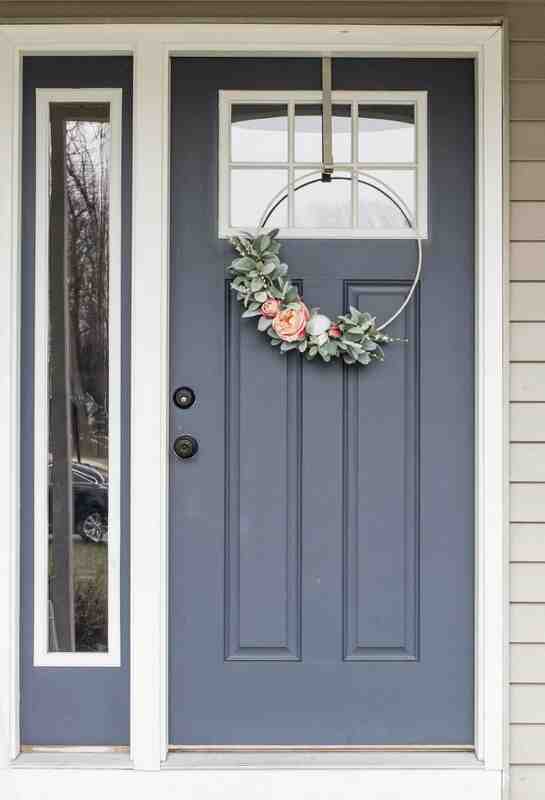 A modern look to the front door wreath! In the end, I blended the looks of the above wreaths and also working within a budget. While I loved the peonies, roses were far more cost effective! The method of assembly is the same no matter the greenery or flowers you choose. I gave the number of stems I used for reference, but the sky’s the limit on this one! Use the colors, flowers, greenery, and amount of each that inspires you! 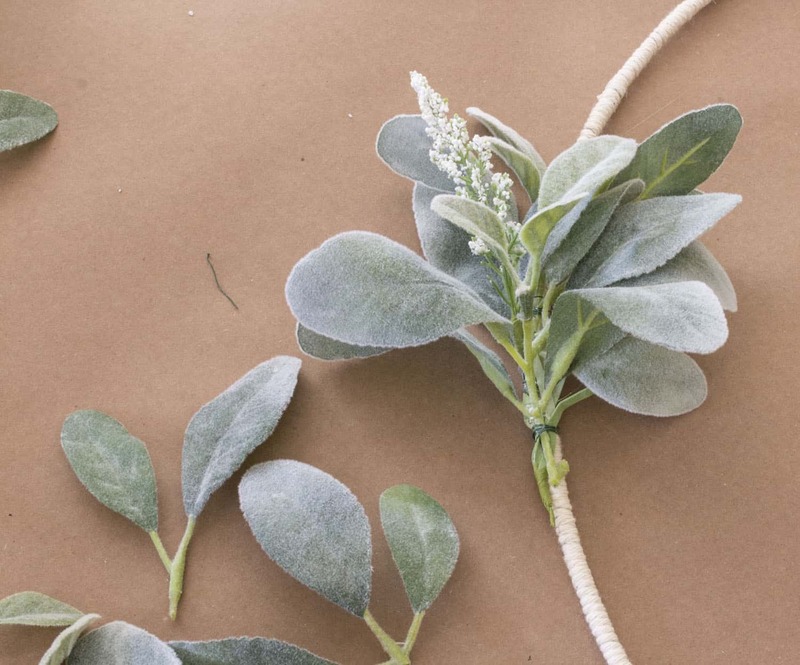 Using the kitchen twine, or any twine you’d prefer, wrap tightly around the floral ring. Top begin, I secured the end of the twine with a dot of hot glue so the twine wouldn’t unravel as I wrapped. 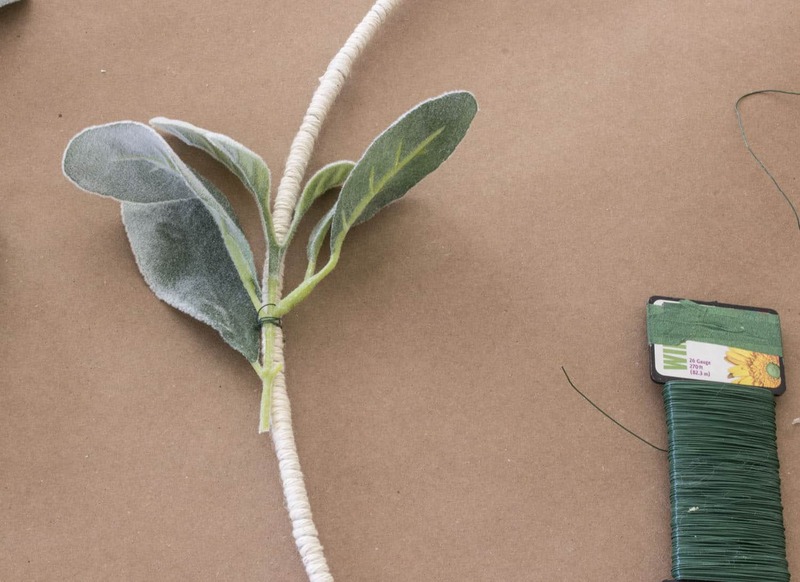 It is easier to wrap while keeping the twine rolled around the spool, don’t cut off a long length. It will get tangled and make a mess. 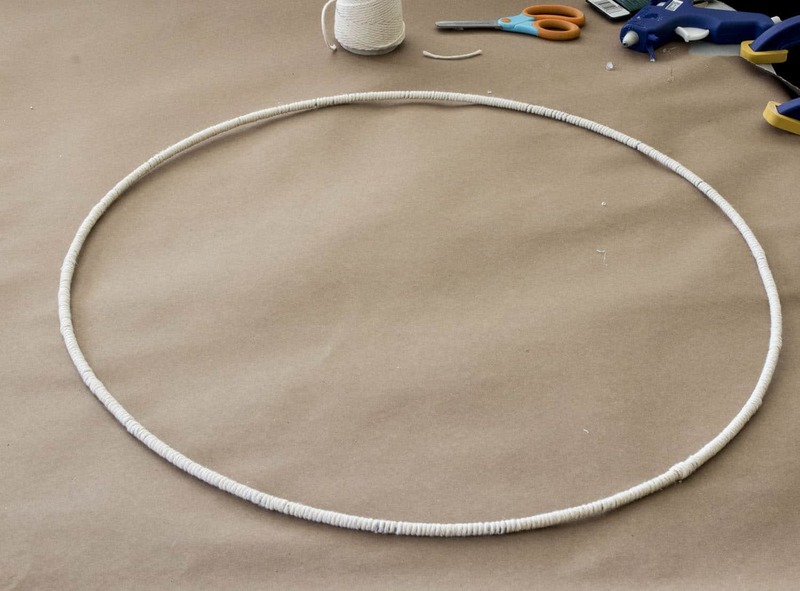 Every couple inches, put a dot of glue on the ring and press the twine into it. This will keep the twine from slipping as you wrap. 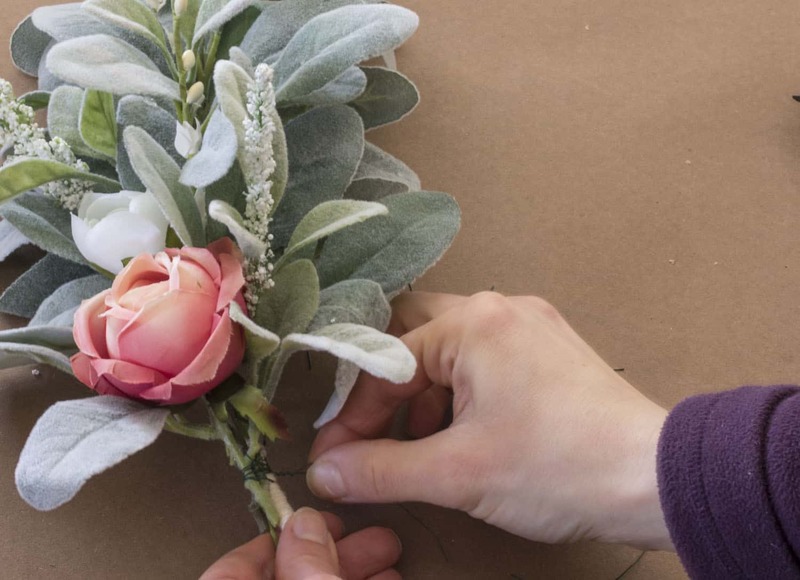 From making boutonnieres and corsages in the past, I know it is easiest to build a full floral piece with small sections of greenery, filler flowers, and focal flowers. 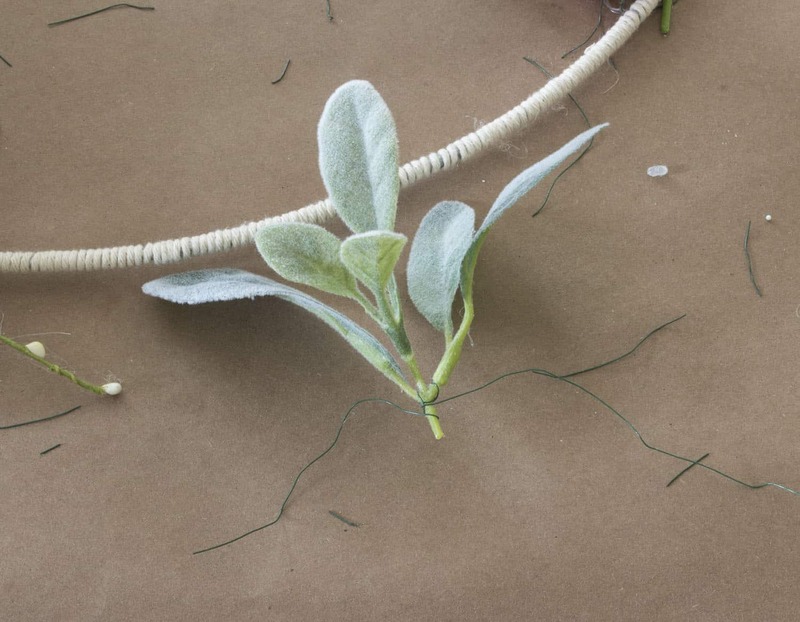 So the first step to building this wreath is to snip the leaves from the lambs ear stem into smaller segments. Only cut a few sections off at a time until you have a feel for how many leaves you like grouped together. I found that number changed as I worked around the wreath. Make sure to leave some stem on each segment. 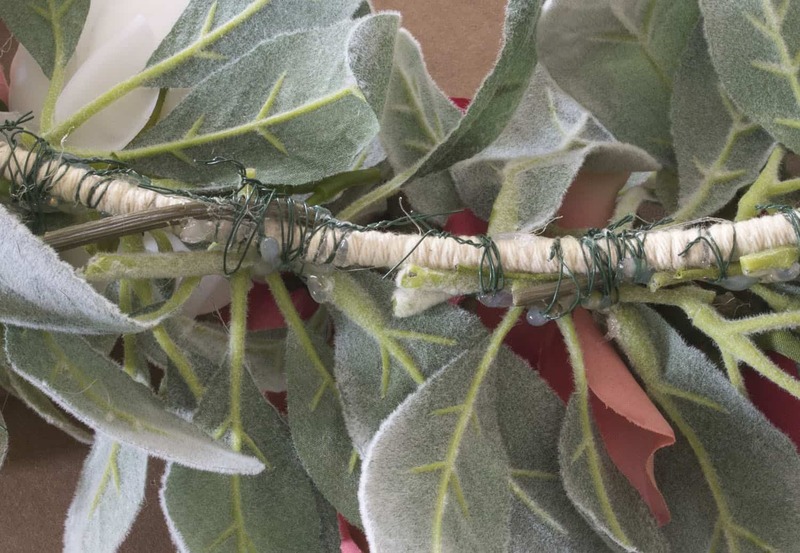 You will need this to wrap the floral wire around and possibly to bend and shape the leaves on the wreath to create depth and fullness. 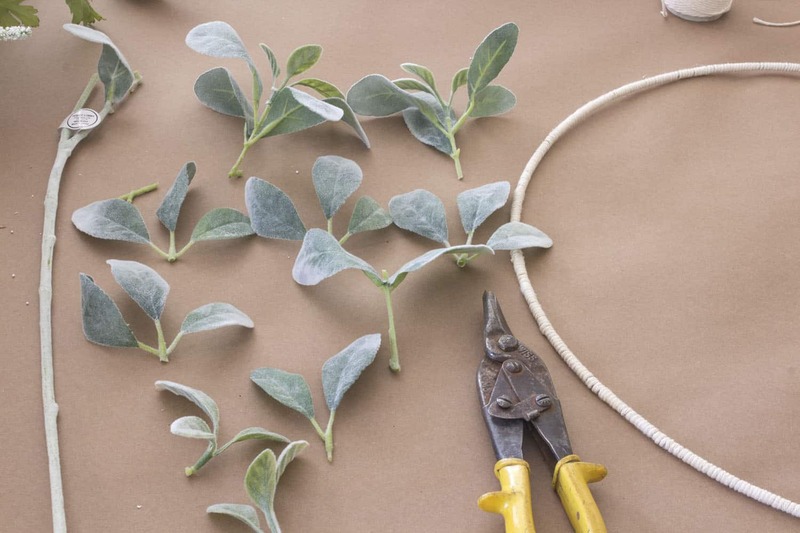 Cut a section of floral wire about 8-10″ long and wrap securely around the base of the leaves and stems. 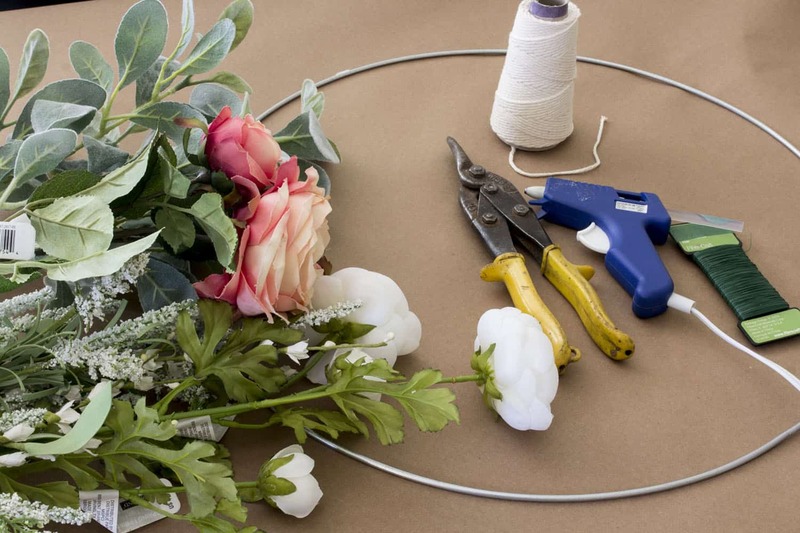 While holding the greenery in place on the floral ring, wrap the trailing ends of the wire around the ring in opposite directions. 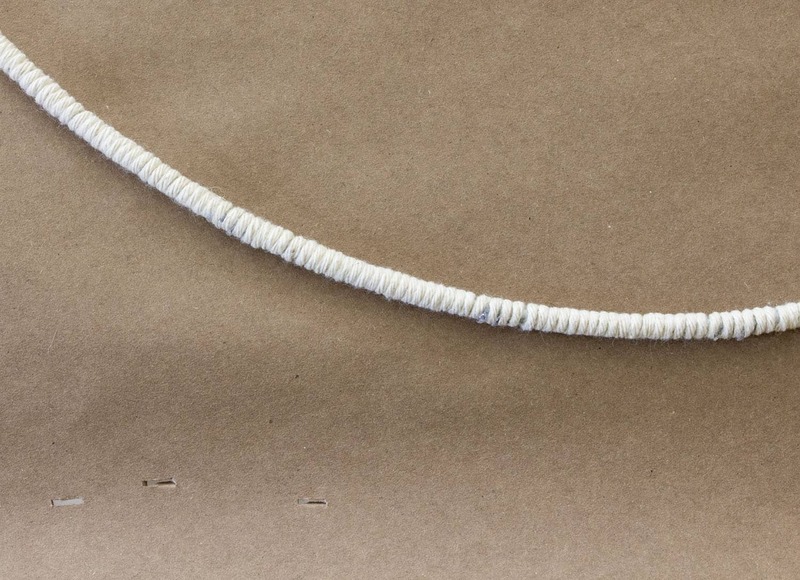 Then secure the wire by twisting the ends together (Like trash bag twisties from the olden days! Do they make those anymore???). Snip the excess wire as needed with the tin snips. I left about an inch of wire and bent it up and around the ring back into the flower arrangement to hide the sharp ends. 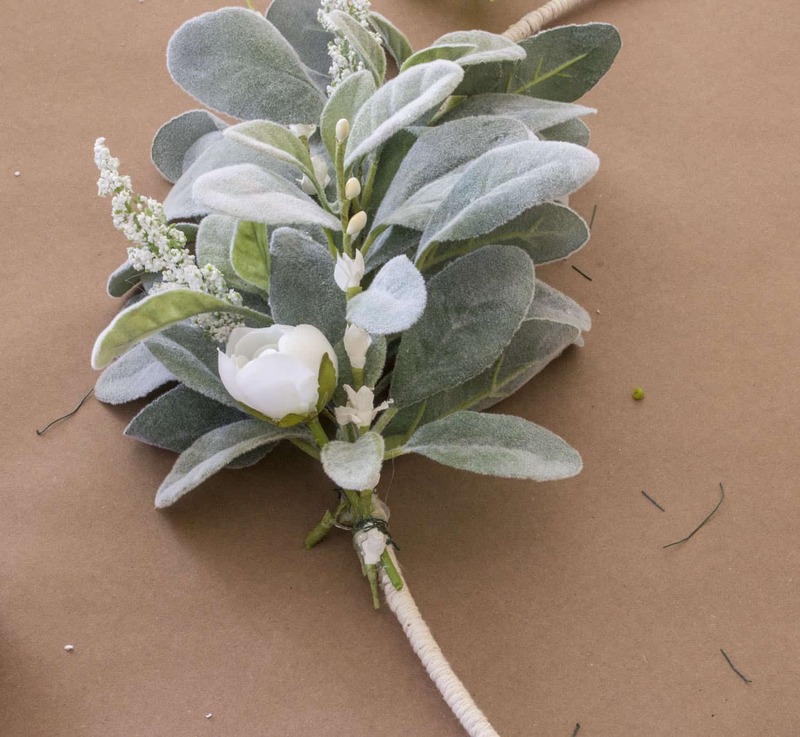 The wire will hold the greenery in place while you tweak the position. Gently bend the main stem or stems of the leaves to position the leaves. For the best looking wreath, position the leaves to point in every direction: left, right, and up. Once you are satisfied with how it looks, add a couple drops of hot glue where the wire is holding the stem to the floral ring. This photo was taken after the wreath was completed, but if you look closely, you can see the twisted wired and clear/white blobs of glue holding everything in place. 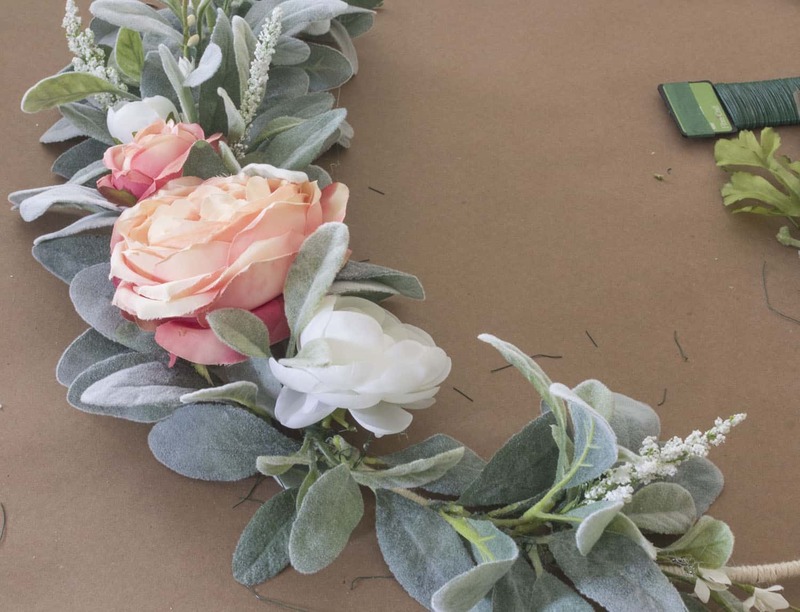 Repeat these steps for attaching each piece of greenery, filler flowers, and eventually the lager focal flowers. Add the focal flowers in the middle of the span of greenery. I added 3 pink rose blossoms and 2 white blossoms (I ended up adding 1 more white bud at the end to fill in a gap.). Make sure to surround the flowers with greenery too. 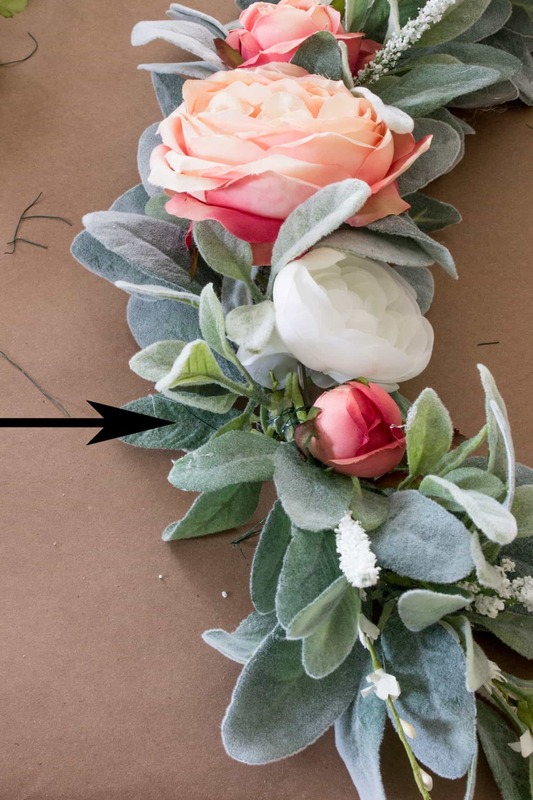 After attaching the focal flowers and their surrounding greenery, finish the other half of the wreath by attaching greens and filler flowers but from the opposite direction. 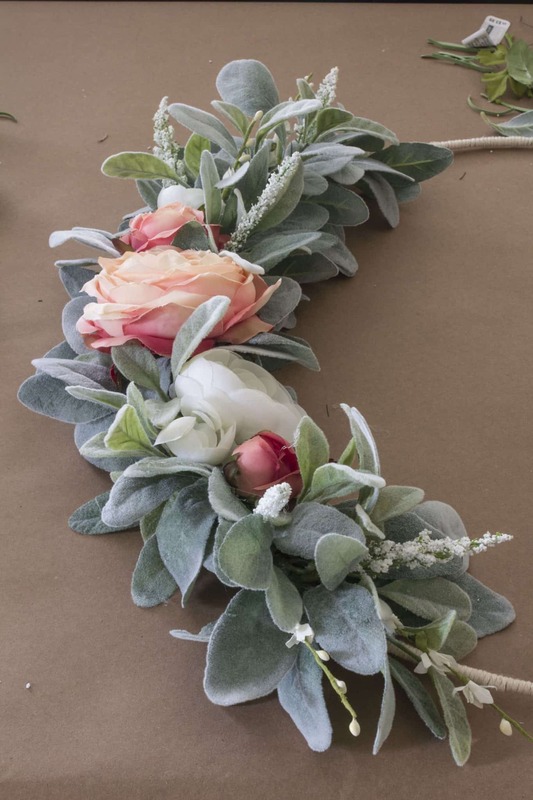 Start at the right where the greenery will end then attach with stems pointing towards the focal flowers. There will be a tight space where the two halves of the greenery/flowers meet up that is really tricky to get new pieces in. See the gap by the arrow in the photo below. Snip off individual leaves and hot glue them one by one to fill in that gap. Mine still looked gap-y so I added one more small white bud next to the pink bud. Experiment with what looks good at this stage. 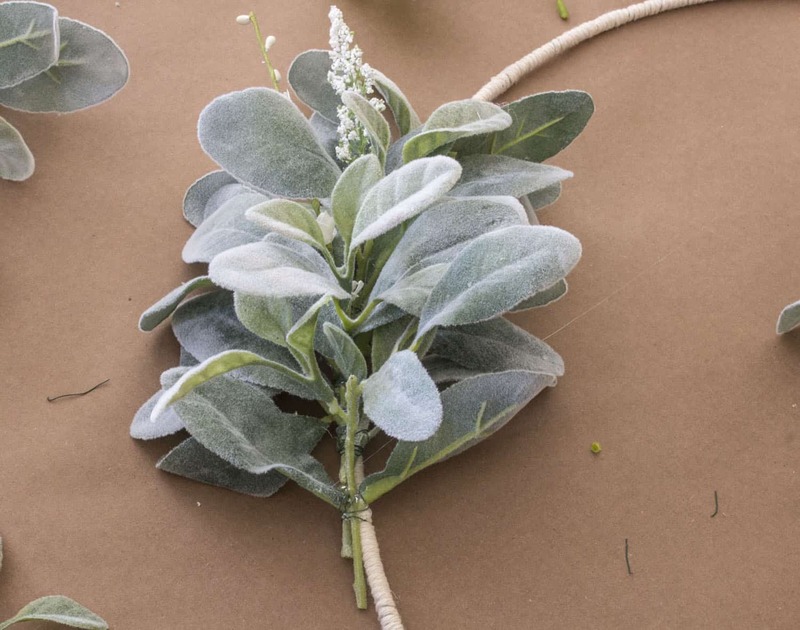 Insert different options (buds, leaves, filler flowers) to see which completes the look. Pick it up off the table too. Holding it up as it will hang will allow you to see any areas that need to be filled in more. Step back and admire your handiwork! Isn’t it fun to create something beautiful for your home? I find it so fulfilling to create things that make my home beautiful for me. Hanging this asymmetrical wreath on the door was tricky. I wrapped more kitchen twine around the ring and door hanger to keep the ring from tilting too much to one side. It’s still a little lopsided, but perfection is not what we’re going for, is it?? 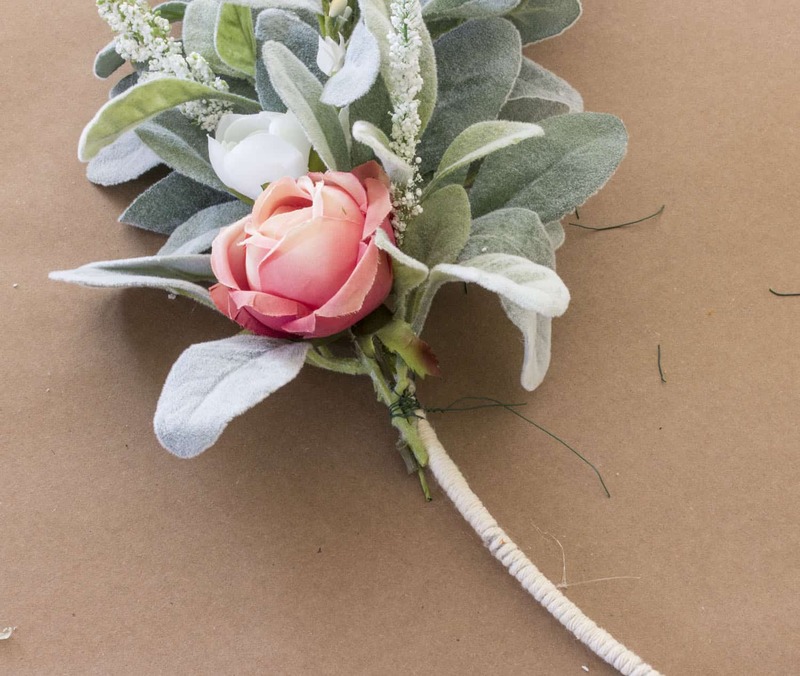 The soft pink of the roses and fuzzy green of the lambs ear is exactly what I was looking for. It gives my front door a fresh new look as the rest of the yard springs to life. Want to remember this? 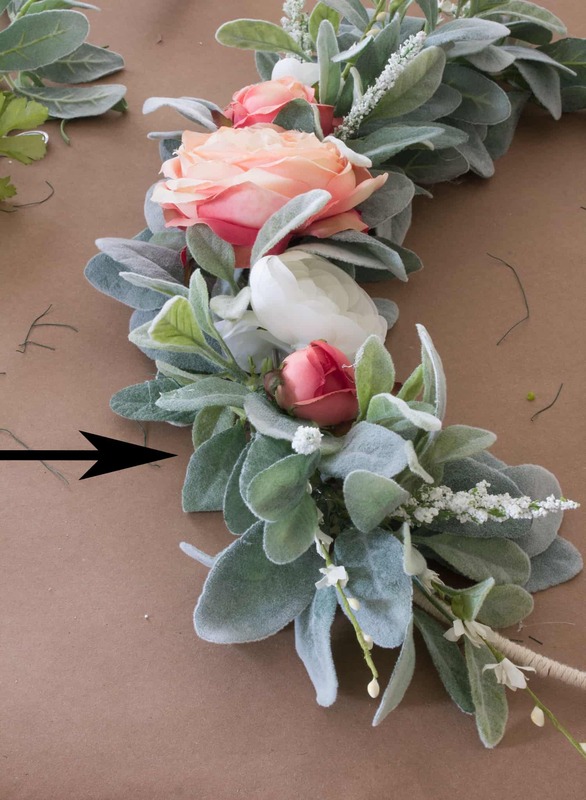 Pin Lamb’s Ear and Rose Asymmetrical Spring Wreath to your favorite Pinterest board!